This entry was posted on 22nd August 2017 by WoodBlocX. 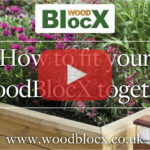 Although WoodBlocX are really simple to put together, they can be used to build strong and long lasting structures for both private gardens and communal areas. Once installed, they are also super-easy to maintain. The building instructions cannot be easier. First of all make sure your BlocX are the correct way up with the big hole at the top. The wedges push into the bottom of the recycled plastic dowels, locking the BlocX into position and the hollow punch protects the top of the dowel when they are tapped into place. That’s it..